Choose Your Risk! Confident Investing In A Dynamic Market. Simple stock screen that yields a small but valuable group of securities with great yielding potential. Considerations for a long/short/stable mindsets on the US economy. First I will start this article with a list of stocks which pass a variety of parameters, with a conclusion on what exactly this list represents in my opinion. Second I will talk about how direction may not matter when investing in some stocks, while taking most popular investing strategies; Dividend, Contrarian, topDown, bottomUp, Technical Analysis, etc. We live in an ever-changing and dynamic market. I believe this an eternal statement as we progress with technology and time. I can attempt to put an perspective on how we are changing with events that are now happening for the first time in history. For one, people are becoming increasingly more aware of financial metrics. Net/Cumulative cash flow, Compound interest, Inflation, ROI, and even Credit Scores might have once been thought of with mass confusion, but are now daily facts of life and financial survival. Capital One bank advertising their new credit score monitoring app. Another trend in the increasing availability of financial securities to the general public, which can pump mass dilusion into our market. One example of this is mobile investing interfaces such as Robinhood, which is one of the most innovative apps in 2016. Finally, I must acknoledge the cyclical perspective on economic recessions. Many, if not all, investors are aware of the dangers of investing like company bankruptcy and market crashes. 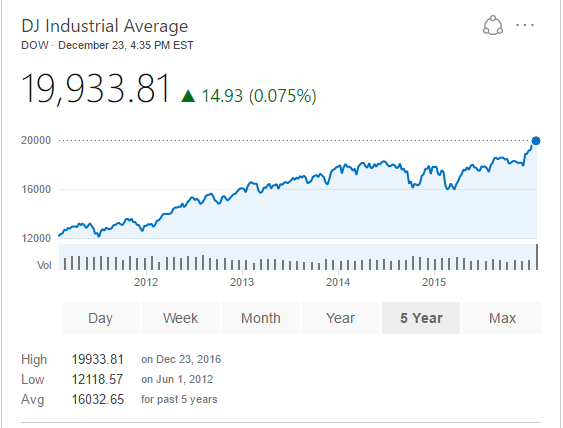 As of late decemeber, we are entering the new year with a refreshed optimism in the aging bullmarket, with DJ Industrial Average battling for 20,000. As you can see on the same graph, 2016 was the worst start to a new year... ever. The investing coin has two sides. All of these trends point towards new money into a aging bullmarket, which can be good, but can also be dangerous with money being pumped in random directions influenced by personal interest of the general public, which equates to dead money that isnt being spent on domestic product. We can go on forever about the effects of any historical move as we can see from every economist not being unemployed. We can also observe how even professional financial advisors can have drastically opposite recommendations from each other, which begs the question if doing the same investments for the wrong reasons really matters in the end(with all other things being equal). With this being said, we can find oppotunities in securities by using the concept of crowdsourcing. This is by finding positions only looking at trending speculation on a particular stock, forming a position without acknoledgement on the mass position on the stock(aka price per share), or for an articles position for that matter. This way, articles add to the maximum potential return (opportunity) of a securities regardless of what is mentioned inside. Most modern investing structures surely regard crowdsourcing as a key metric in measuring future prospects/volatility. This screen leaves us with a secure investing platform as a start. This means that these are only mid-cap, large-cap, mega-cap stocks. Sorry Gamblers! This screen also leaves us with stocks that pay secure dividends. By secure dividends I mean a dividend history that doesn't trick investors; The stock has a great increasing-only dividend history and didn't drop dividends at all, including through the last 2007 recession. Companies that haven't started before 2007, sorry but we just don't know what you'll do when we need our money the most. Finally, I use basic crowd-sourcing principals. These are stocks that have high speculation as of December 2016. All of the screens done are to find valuable qualities for a position regardless of investment strategy. Before I add the list, I must give a warning: I try to find opportunity, which can mean negative and positive outlooks for securities. If the future was known there would never be any opportunities. This list is sorted by dividend yield, which can be seen in some eyes as a general metric for risk. The company ticker is noted along with dividend yield in %. Many investors will try to seek safer growth in investments in the midst of 2017 federal rate hikes, the inauguration of a controversial leader in January, the average time between recessions since 1991 being 13 months weighing on a multi-year bull market, last years worst new year(cited above), and much more that can be read from every other economist trying to predict the next recession. We can see evidence for safer investing in the performance of high dividend sectors outperforming other sectors in the US, such as Energy and Financials. With this being said, many high yielding dividend securities are very risky and built to trick greedy investors. Please do your due research before risking money. Any time in December 2016 you can look on Seeking Alpha and see the craze for high yielding REIT's in their trending articles section. Disclaimer: Opinions expressed herein by the author are not an investment recommendation and are not meant to be relied upon in investment decisions. The author is not acting in an investment, tax, legal or any other advisory capacity. This is not an investment research report. The author's opinions expressed herein cannot be a substitute for comprehensive investment analysis. Any analysis presented herein is illustrative in nature, limited in scope, based on an incomplete set of information and has limitations to its accuracy. The author recommends that potential and existing investors conduct thorough investment research of their own and consult a qualified investment adviser. The information upon which this material is based was obtained from sources believed to be reliable, but has not been independently verified. Therefore, the author cannot guarantee its accuracy. Any opinions or estimates constitute the author's best judgment as of the date of publication, and are subject to change without notice. The author explicitly disclaims any liability that may arise from the use of this material.